At Golfing4Life we are dedicated in establishing a talent pathway which enhances life and academic education. Our ProdreamUSA scholarships provide players with expert advice from the leaders in global collegiate consultancy. Brendan McKenna and his team have relationships with the finest college coaches in America. These relationships ensure every player has every opportunity to secure the best possible placement for their golf and academic careers in America. From 2018 Golfing4Life will support young players with NCAA registration and SAT exam bursaries , confirming our commitment to further education and the importance of obtaining a degree. 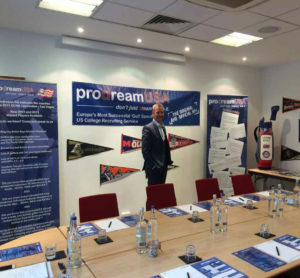 Prodream USA are proud of what they have achieved over the last 13 years. procedures. Quite simply, there are no recruiting companies in the world that can emulate the ProdreamUSA service”.